The axe is one of mankind’s oldest tools probably only predated by the simple club. Over the millennia it has evolved in numerous forms as a weapon and a tool with many variations depending on its specific use. The Boarding Axe was one such variant that rose to fill a military niche that lasted barely two hundred years before history rendered it redundant. The boarding axe was a combat tool and weapon from the fighting age of sail and has become one of the rarest survivors from that period. Once a common implement found in large quantities on all armed sailing ships, it has almost, by virtue of its lowly status, become extinct. 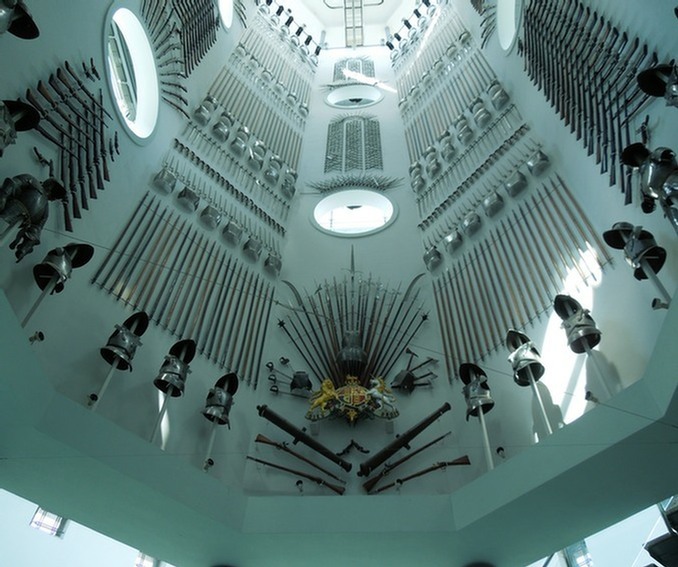 Even the major arms and armour museums like the Royal Armouries at Leeds, pictured above, can boast only a handful of boarding axes. Most of the great sea-faring nations had regulation patterns of axe for their respective navies but they were also made in numbers by manufacturers or singly by individual blacksmiths who supplied the merchant fleet and privateers. Some regulation models are now so rare that they can command very high prices. Although every effort has been made to verify the accuracy of the information contained in this website it cannot be guaranteed. The scarcity of written work, personal interpretation of material, the dangers of translation and the limited amount of surviving examples may have led to inaccuracies. The two measurements generally given for each axe are the total length, including the head and shaft, and the distance from the edge of the axe blade to the point of the spike. These are to the nearest quarter inch and half centimetre. All articles, descriptions and photographs, where not otherwise attributed, are the copyright of Seaxe. Copyright © 2015 Seaxe @boardingaxe.com · All Rights Reserved.